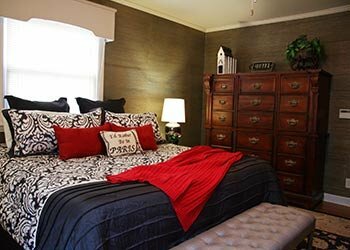 The Inn at Bigby Creek's rooms must be seen to be believed! 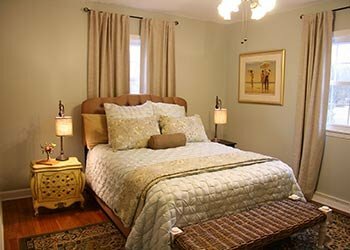 These charming and unique rooms all offer private bathrooms and are all on the ground floor. 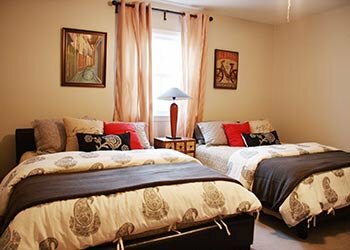 The different rooms of the Inn include a den with large TV, perfect for watching movies and enjoying beverages and snacks which are available at all times. There is a large fireplace for those cold winter nights, a library where books can be borrowed and returned or taken with you! The formal side of the house is perfect for visiting, reading, or playing one of the many games that are made available. Also offered is a computer for your use and plenty of paper and pens for whatever writing needs you may have. Large Flat Screen TV available in Den. We are happy to put a movie of your choice on, any time of day.